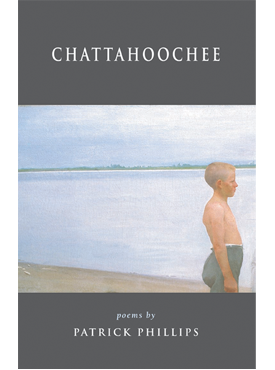 A river runs through Patrick Phillips’s collection Chattahoochee, and through a family saga as powerful and poignant as the landscape in which it unfolds. Here are tales of a vanished South, elegies for the lost, and glimpses of what Flannery O’Connor called the “action of grace in territory held largely by the devil.” In language delicate and muscular, tender and raw-boned, Phillips writes of family, place, and that mythic conjunction of the two we call home. Patrick Phillips has won a “Discovery” / The Nation Award from the Unterberg Poetry Center of the 92nd Street Y, a Gulf Coast Poetry Prize, and was a finalist for the National Poetry Series. His poems have appeared in Poetry, the New England Review, Agni, the Gettysburg Review, The Nation, Rivendell, and the Virginia Quarterly Review. A past Fulbright Fellow, he has held fellowships at the MacDowell and Millay colonies. He is currently a Henry Mitchell MacCracken Fellow at New York University. He lives in Brooklyn with his wife and two children. Winner of the 2005 Kate Tufts Discovery Award. The award is presented annually for a first book by a poet of genuine promise.